UNCASVILLE, Conn. – May 12, 2016 – Barrett-Jackson, The World’s Greatest Collector Car Auction®, is headed to Connecticut for its inaugural Northeast Auction June 23-25, 2016, at Mohegan Sun. Theinaugural event will featurea broad range of vintage, customs, supercars and late-model vehicles.Some early highlights include the one-of-one custom 1967 Ford Mustang known as “Obsidian” (preview), a 1970 Plymouth HEMI Superbird (preview), as well as a1968 Shelby GT500 KR Convertible (preview). 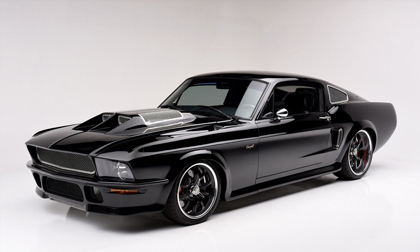 Among the highly anticipated bidder favorites is an exceptional one-of-one custom1967 Ford Mustang known as “Obsidian” (preview). A true head-turner, every inch of this car has been customized, with more than $1.3 million invested in the car’s research, development and build. This unique pony car features a fuel-injected 392ci V8 with twin Rotex superchargers that produce 847horsepower and 750 ft/lbs of torque. Additional features include a pair of air-to-air intercoolers integrated into the hood and a Tremec TKO 600 5-speed. With a 0-60 time of just four seconds, this masterpiece has everything a true performance enthusiast could want. Also crossing the block at Mohegan Sun will be a rare, matching-numbers 1970 Plymouth HEMI Superbird (preview). One of only 77 HEMI automatics, this 426ci Superbird puts out 425hp with two 4-barrel carburetors, and features power steering and power disc brakes. It is highly documented with the original Broadcast Sheet and original owner’s manual as well as a 20-page in-person visual inspection by Galen Govier verifying that it has the original drivetrain components. An original, matching-numbers 1968 Shelby GT500 KR Convertible (preview) will be another highly anticipated vehicle to cross the block at Mohegan Sun. This Highland Green 4-speed convertible includes the original, matching-numbers motor and transmission, as well as the original sheet metal and fiberglass. A Deluxe Marti Report and an original dealer invoice verify this Shelby’s originality and are included in the sale. Highlighting the European marques on the Mohegan Sun auction docket is a concours-ready 1966 Porsche 911 (preview) finished in Irish Green and upholstered in tan leather with plaid seat inserts. Like all 1966 Porsche 911s, a 2.0-liter Flat 6 powers this vehicle. As the 911 production began just one year earlier in 1965, this is among the earliest examples of the iconic model. Also included is a Porsche Certificate of Authenticity. The inaugural Northeast Auction at Mohegan Sun, June 23-25, will be broadcast live on Velocity and Discovery Channel. For more information on becoming a bidder, follow the link to http://www.Barrett-Jackson.com/Bidder/Home. Established in 1971 and headquartered in Scottsdale, Arizona, Barrett-Jackson, The World’sGreatest Collector Car Auctions®, is the leader in collector car auctions and automotive lifestyle events. The company produces auctions in Scottsdale, Arizona; Palm Beach, Florida; at Mohegan Sun in Connecticut, and Las Vegas, Nevada. With broadcast partners, Velocity and Discovery Channel, Barrett-Jackson will feature live television coverage in 2016, including broadcasts in over 100 countries internationally.Barrett-Jackson also endorses a one-of-a-kind collector car insurance for collector vehicles and other valued belongings. For more information about Barrett-Jackson, visit http://www.barrett-jackson.com,or call 480-421-6694.